Should you refinance your mortgage? Learn if now is the right time or not. When you are in debt, you want to work hard to do what you can to pay those debts down sooner. So, does it make sense to increase your monthly mortgage payment just to get out of debt sooner? Most people have a 30 year mortgage. You might have opted for this repayment method as it was the easiest. It could also have been because that was the lowest payment. It could even be because you didn’t know you could pay it off sooner. You might currently have a rate that you consider to be pretty good – it might be between 5 – 6%. Rates have been decreasing again lately. What Kind of Mortgage Interest Rate Should You Get? In fact, you might find them hovering around 3% through many lenders. That means it might be the PERFECT time for you to refinance your mortgage to a 15 year note instead. My husband and I were always 30 year mortgage home owners. We thought a 15 year was not wise for us, based upon our financial situation. We have learned that we had to change the way we also looked at our mortgage payment. It was more than just what we had to send to the bank each month. What became more important was the total amount we would have to repay. A few years ago, we refinanced our own mortgage. And, we, like so many, opted for a 15 year re-payment schedule. Our payment increased by just $100 a month – that was it!! The bigger issue was the amount we will put into our pockets. Over the course of the life of the loan, we will end up saving more than $100,000 in interest! As an added bonus, we will be out from under our mortgage by the time our children finish high school. There is actually even more to consider regarding home ownership since the economy declined. Gone are the days of no-money down loans. Now, most lending institutions require a 10-15% cash down payment. Also gone are the days when we can go ahead and purchase a home worth what the bank says they will loan to us. Instead, we are all forced to take ownership of our own budget and financial well being. No longer is the status quo that we all can own a home worth 3x our annual income. Instead, less is more is the new mantra. 1. Do you have an equity in your home? If you don’t have at least 20%, then you will still have to pay Private Mortgage Insurance on top of your monthly payment. Of course, that doesn’t mean you can’t or should not refinance. There are programs out there which can help. Just talk to your lender so you know ahead of time if you will have to pay this additional monthly premium. Are you able to save for retirement and/or college? Do you have additional disposable income each month that you can use towards this financial obligation without sacrificing others? Do you have a fully funded emergency fund? Just know what your own goals are before you jump into a refinance. 3. How long do you plan to live in the home? If you know that this is not your dream home and you hope to purchase a new one in a few years, it may not be wise to refinance. However, if this is your “forever home”, it is smart. Before you decide, make sure you know your “break even point” — the time when your savings outweighs your costs. Your lender can help you with this calculation. A good rule of thumb is if you plan on staying in the home for at least 3 or more years, it could be smart to refinance. 4. Will the savings be worth it? 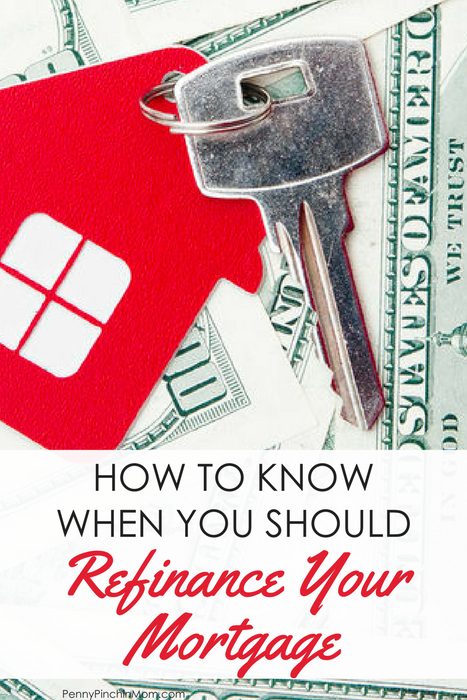 There are definitely costs associated with a refinance including an appraisal, origination and other fees. Make sure you take these into consideration as you may want to pay them up front rather than roll them into the mortgage – which can affect your payment. Do the math to determine how long it will take for you to begin showing savings (after taking these fees into consideration). Your mortgage lender can help you with these calculations. It can also be helpful to use an online mortgage calculator. MSN Money has a great one you can use. You just plug in the figures and it will tell you if it is wise to go ahead and contact a lender or not. 5. Is the rate decrease enough to take the time to do it? A good rule of thumb is if you can reduce your rate by 1 1/2% or more, then it might be wise to consider refinancing. Anything lower than that — and you might want to just pass. Keep in mind those closing costs as that can affect your break even point — the time when paying to refinance moves from additional costs to savings. Whatever you decide to do, make sure you work with a reputable Mortgage company. If you can’t get the answers to all of your questions, you might want to consider using someone else. A good lender will take the time to work though everything with you and make sure you feel comfortable with everything before you sign on the dotted line. A refinance is not an option for everyone, but it might be something you want to consider while the rates are still as good as they are. Smart advice. I’m glad we went with a 15 year mortgage last time we refinanced. It’s such a huge difference. We still lowered the monthly payment, and now we are only two years away from having our house paid off. A couple of years ago, two of my coworkers were bragging about how much they were “saving” by refinancing their houses, but it was mostly due to spreading the payments over a new 30 year term. One of them will bumped his payoff date out into his 80s. No thank you!